Charlie employed a very effective technique with his Chevelle model; he used an AMT/ERTL Olds 442 chassis. 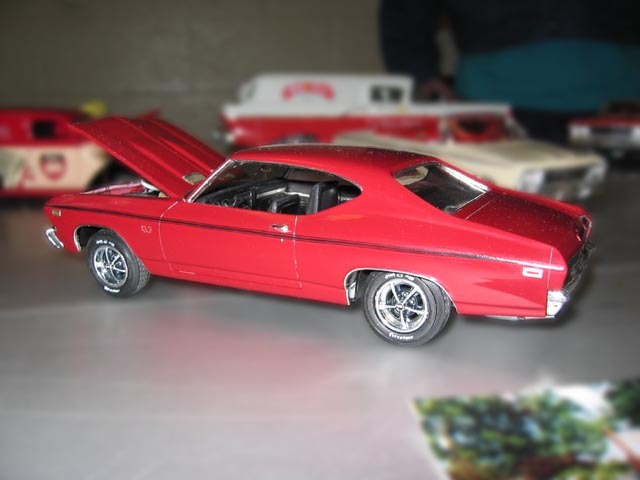 Doing so not only replaces the Chevelle kit's less than interesting chassis with one that's nicely detailed, it provides poseable steering as well. Added details include a fuel line, aluminum tail pipe extensions, and valve stems. Although hard to see in this shot, Charlie re-shaped the kit's taillights for improved accuracy. Though the interior is basically stock, Charlie did add a column-mounted tach, turn signal stalk, and flocking on the floor.